I found this photo when I was organizing some of my pictures. It's a bento from a couple weeks ago that I forgot to post! On the left is pizza cut into small bite sized pieces, and Goldfish crackers. This is packed in a Sassy box with just one of the inner dishes used. Just had to stop by and say I packed my first bento for myself yesterday and loved it! Thank you for the inspiration. I'm a teacher, so I only get about 20 minutes to eat after dropping off my first graders in the cafeteria and stopping at the restroom. Because of my limited lunchtime and desire to eat more whole foods, I am playing with bentos for myself. My first lunchbox is from laptop lunches, but I'd love to get another kind so I can rotate. (No dishwasher in the house.) Any info you have on bentos for grownups will always be appreciated (by me). I taught for a few years before having children and I remember those very short and rushed lunch times (and not very fondly, either!). Love your bento lunches. I'm fairly new to this but I'm looking forward to making these for my kids. I do have one question. Your lunches always look so healthy. I was curious as to your thoughts on msg. Is that something you worry about? We're trying to eliminate it as much as possible and it's so hard because it's in so much processed food. It's hard to find snack food for my kids lunches without it. 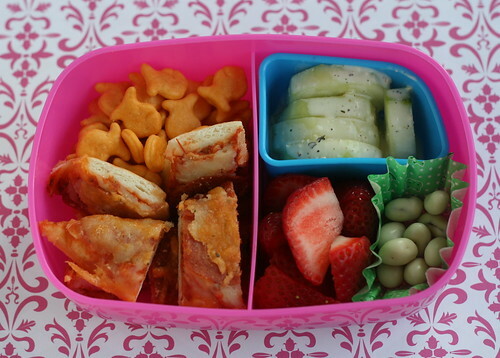 Love the ideas for bento lunches. Thanks so much for sharing. I do have one question. What are your thoughts on msg? We're trying to avoid it as much as possible but it's really hard to find any snack (processed) foods without it. Hi Denise! We try to avoid it too, but it is SO hard! We can't afford to buy only organic packaged items (nor do we like all the organic variations of many things), so it is definitely a challenge. My husband gets headaches if he has too much of it, so that is concerning too! I was appalled when I discovered awhile back that a Big Name nut company that also sells sunflower seed kernels adds not only salt to the kernels (which I don't mind at all - yum! ), but also MSG!! Unbelievable! Sunflower kernels is not something that would even been on my radar for MSG "contamination". You definitely can't be too careful or make any assumptions about what sort of additives are in packaged food, that's for sure. :( Luckily there are plenty of non-Big Name companies selling natural sunflower kernals without unnecessary additives, but that's not the case with everything. Too often finding healthier substitutes is just impossible. I quit buying "fruit" snacks about a year ago and started buying only fruit leather and occasionally the Annie's brand of organic bunny fruit snacks... but my older boys are not fans of these substitutes. They both complain bitterly over the lack of "fruit" snacks in their lives. Mostly I focus on weeding out HFCS and especially PHO's and limiting artificial colors.... we are not perfect and this stuff still needs in. But we are trying.